If you like these cartoons, please help me make more by supporting my Patreon! A $1 pledge really helps. 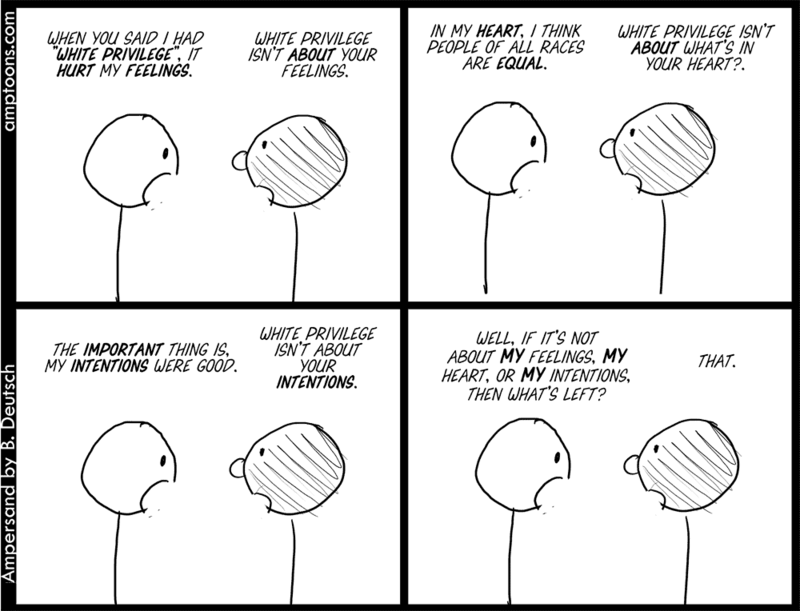 This comic strip deals with the tendency of white people to argue that their personal purity of heart is the essential subject to focus on when the subject is racism. And this is a tendency I entirely understand! I’m white; I know that emotional/denial place is so easy to jump to. Plus, we’re all humans, and being human tends to overlap a lot with being self-centered. But it’s a knee-jerk reaction we should resist. And maybe cartoons like this one will help whites like me remember to resist. A bit of trivia about the making of this cartoon: As I think I’ve mentioned, I recently turned fifty. And, technically, I have been working on this cartoon since my thirties. You see, I write more cartoons than I complete. Very often, when I write a cartoon, I’ll decide that it’s not good enough to draw – but there’s still a seed of an idea there that I believe can work. In those cases, I’ll leave the cartoon lying around in a folder labeled “unfinished.” Every now and then, I browse old ideas in that folder, in case my brain comes up with a way to make any of them work. So, in September of 2008 (so I was 39 and 11 months old), I made this layout for a cartoon. (I think I must have been in a hurry – you can see that I just cut and paste the same minimalistic lollypop-stickfigures from panel to panel). I remember, when I wrote this strip, I thought “that” was a pretty devastating final line. But when I looked at it again, a few days or weeks later, it just seemed too obscure to me, and might leave some readers scratching their heads. Would the theme – that the white character was entirely self-focused, ignoring what’s going on with the Black character – come through? Plus, the comic strip was so static. So it just sat in my “unfinished” file for an entire decade. I was too fond of the idea to throw it out, but never had an idea for fixing it. The idea – “the comic strip starts out entirely focused on the white character, a metaphor for his self-involvement, and the view gradually widens until the reader can see what he’s ignoring” – is pretty simple. But I like it, and I’m pleased I waited a decade for it rather than drawing my original conception for the cartoon. A middle-aged white man, balding, with glasses, a van dyke beard and a v-neck long-sleeved tee, is speaking. He’s in a park, with trees and grass. He holds one palm out in an “explaining” gesture. This is a fairly close shot, mainly showing his head and shoulders. He is facing towards the left. 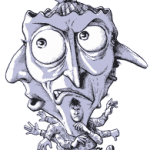 An unseen person off-panel, on the right, responds to him. WHITE PERSON: When you say I’ve benefited from racism, it hurts my feelings. 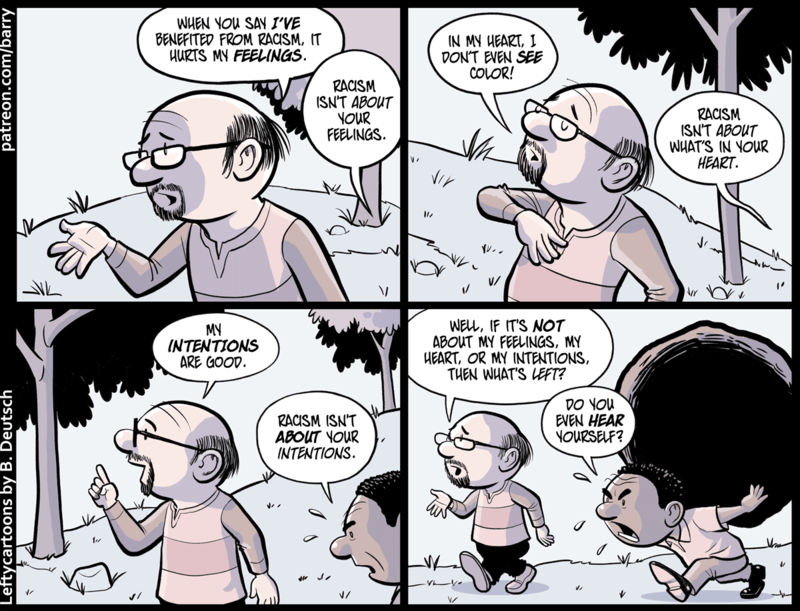 OFF-PANEL PERSON: Racism isn’t about your feelings. The camera backs up a bit, but the other speaker is still off-panel. The white guy closes his eyes and puts one hand over his heart, as if he’s swearing a vow. WHITE PERSON: In my heart, I don’t even see color! OFF-PANEL PERSON: Racism isn’t about what’s in your heart. The camera has backed up enough so we’re seeing the white guy from his waist up. We can also see, just barely in panel, the head of the other speaker, who is a Black man. They seem to be walking The white man is holding up a forefinger to make a point, smiling, and looking ahead rather than looking at the Black man. The Black man looks stressed and is sweating. WHITE PERSON: My intentions are good! BLACK PERSON: Racism isn’t about your intentions. The camera has backed away enough so we can see both characters from head to toe. The white man, still looking ahead, is making another “explaining” gesture as he walks. The Black man is bent over double as he walks, due to the enormous boulder he’s straining to carry on his back. WHITE PERSON: Well, if it’s not about my feelings, my heart, or my intentions, then what’s left? BLACK PERSON: Do you even hear yourself? i like this cartoon, and i very much like it when you tell us the things that happened before it was done, you should maybe do that more? it is very interesting. True. Very true. I sincerely agree. Now, let’s see that applied to the concept of “microaggressions” and “safe spaces” and demands that conservative speakers or speakers who have opinions other than those approved by the left regarding what is or is not racism, sexuality, gender roles, immigration, religion, politics in general, etc. be restricted from appearing at or speaking on campuses because they make people “feel unsafe”. You need to pay closer attention to the implications of that possessive, Ron.